Breaking Dawn... 10 years later. LOL. Wallpaper and background images in the Critical Analysis of Twilight club tagged: twilight funny breaking dawn edward cullen robert pattinson sparkle. This Critical Analysis of Twilight photo contains 피부, 스킨 톤, 누드 컬러, 부분 벌거 벗음, 묵시적 누드, 부분적인 벌거 벗음, 묵시적인 누드, 묵시적인된 누드, 부분적인 벌거숭이, skintone, 초상화, 얼굴, 근접 촬영, 얼굴 만, 세로, and 헤드샷. There might also be 큰 덩어리, 한 조각, 6 팩, 복근, ab 균열, 평면 위, 여섯 팩, 위 평면, and 6 팩 복 근.
AAAARRRHHH! why Katiecain? Why have you implanted such an image in my head forever! I'll have nightmares tonight now!!!! It can't get any better than that!!! LOL! omg i literally died laughing! I have to scrub my brains out.... AGAIN! How many times do I have to do this on this spot?! 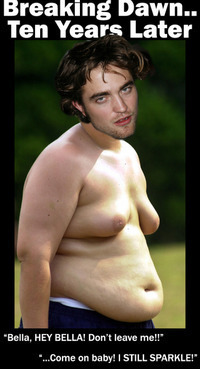 I much prefer his fake abs.